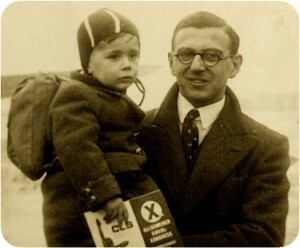 For 50 years, Nicholas Winton kept an explosive and dramatic secret from his wife. It was only after she found an old scrapbook in the attic of their home – names, documents, photographs – that he first told her about his secretive work in organizing the escape of more than 650 mostly Jewish children out of Czechoslovakia during World War II. Many of us have heard the heroic stories of Oskar Schindler and Raoul Wallenberg. Like those men, Nicholas Winton courageously risked his life to save young children from the unspeakable horrors of the Nazi concentration camps. He died this week in Maidenhead, England, at the age of 106. The gripping obituary written by Robert D. McFadden in the New York Times is well worth reading and tells his story at greater length. Read it HERE. Nicolas Winton lived as if the risks were worth taking. More than 650 children escaped Nazi torture because of the pivotal decisions he made. Their families mark his passing with great gratitude – as should we.